Well it’s been a while between posts. I lost my first true adult love and dear friend of 20 years just six weeks ago. An early and completely unexpected death. RIP Jimmi, I know you are watching over us. We have also been busy getting our house ready for sale, and I’ve returned to work after a loooong time off. So I haven’t been up to writing until now. And once again I’m going to mix it up…I had intended to write about Sophie’s speech development. 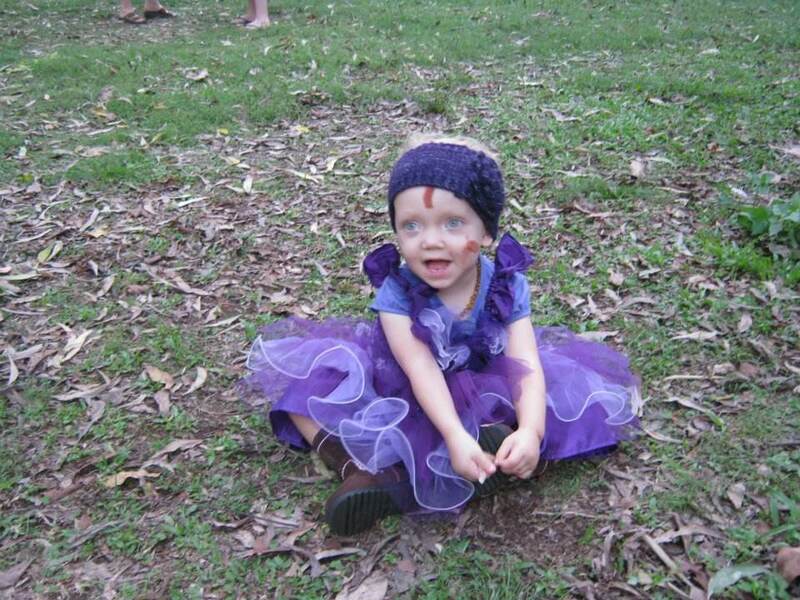 But Sophie attended her first ballet class a few weeks ago, so I’m moved to write about her motor development. My blog, I can change the rules :). 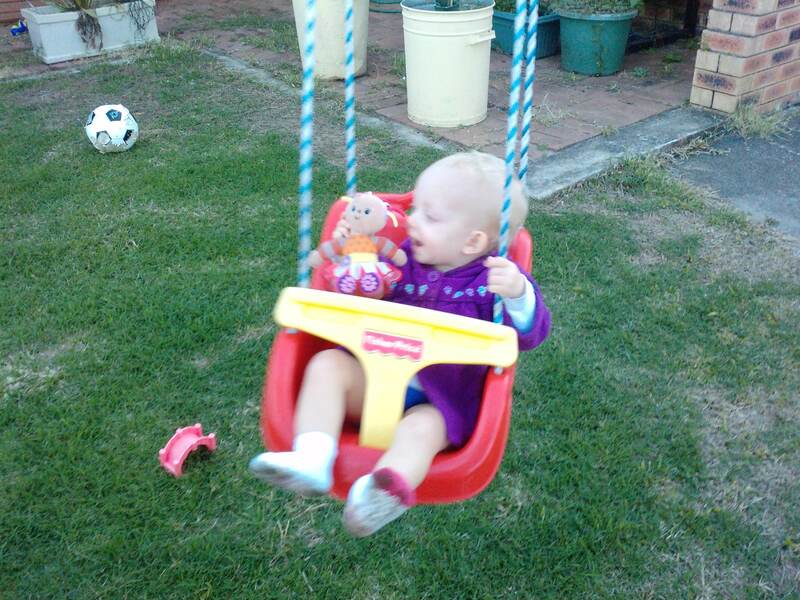 Right from the beginning, it was evident that Sophie had some differences in her motor development. She didn’t have a grasp reflex or a rooting reflex. She felt very floppy as a newborn and infant. It was like she was sliding through our arms when we tried to hold her. She always needed to be held and supported with two hands…no holding the baby in one arm while getting on with household chores for us! She never curled up into that cute fetal position that babies tend to love. Here is our attempt at one of those cute curled up baby photos, when she was just a few weeks old..fail! I took her to a baby massage class, and while the other babes relaxed in bliss, she squirmed, struggled, cried and was quite unhappy with the whole rigmarole. She made lots of jerky, flailing movements with her arms and legs, which while cute and endearing, I recognised as not being “normal”. She didn’t hold her head up until around four months of age. For tummy time, we placed a rolled up towel under her chest, as she had no apparent desire or motivation to lift herself up. She had head lag until she was over a year old (usually resolved by three months). She retained her Moro (startle) reflex until she was more than 9 months old. This reflex should usually disappear by 4 to 5 months. Retained reflexes, like missing reflexes, are an indicator of physical delays. She was too floppy to sit in a bumbo chair or high chair unsupported, even at 6 months old, so we used to prop her up with folded towels all around her, so she could “sit up” to eat. I couldn’t ignore her physical differences, so from very early on I started “googling” to try to find ways to help. I have no idea where I found the time or strength to research, given the sleep deprivation, feeding issues and other concerns. But I suppose as mums we do whatever it takes to give our child the best start, even when we are beyond desperate for sleep and respite. From when Sophie was about two months old, we attempted to get her more comfortable with massage. As we had heard this was good for training the brain, and assisting with motor integration. It wasn’t something she relaxed into, so we took it slowly. Just a small belly rub during nappy changes. Or rubbing her arms or legs when she would allow it. Some lights stroking, some heavier stroking. We started to do “crossover” exercises with her when she was about three months old. So each time we changed her nappy, we would take her left arm and touch it to her right foot, then take her right arm and touch it to her left foot. Rinse and repeat. We started to do joint compressions at bedtime. All in an effort to increase her comfort with touch, help build neuro-connections and give her as many sensory experiences as possible. At least four or five time a day we would take her little arms and gently try to pull her up to sitting, supporting her head as necessary. Trying to help build her abdominal and neck strength. Even now, at nearly five years old, she rolls onto her side to get up from lying down, rather than having the strength to use the “sit up” style form of moving from lying to sitting. While some of her physical milestones were (and still are) quite delayed, in others she managed to “make it” just within the “deadline”. Sophie sat at 8 months. She crawled at one day before nine months (the hospital had advised us to bring her back if she wasn’t crawling at nine months…she must have known..I’msure she was sick of hospitals by then!). 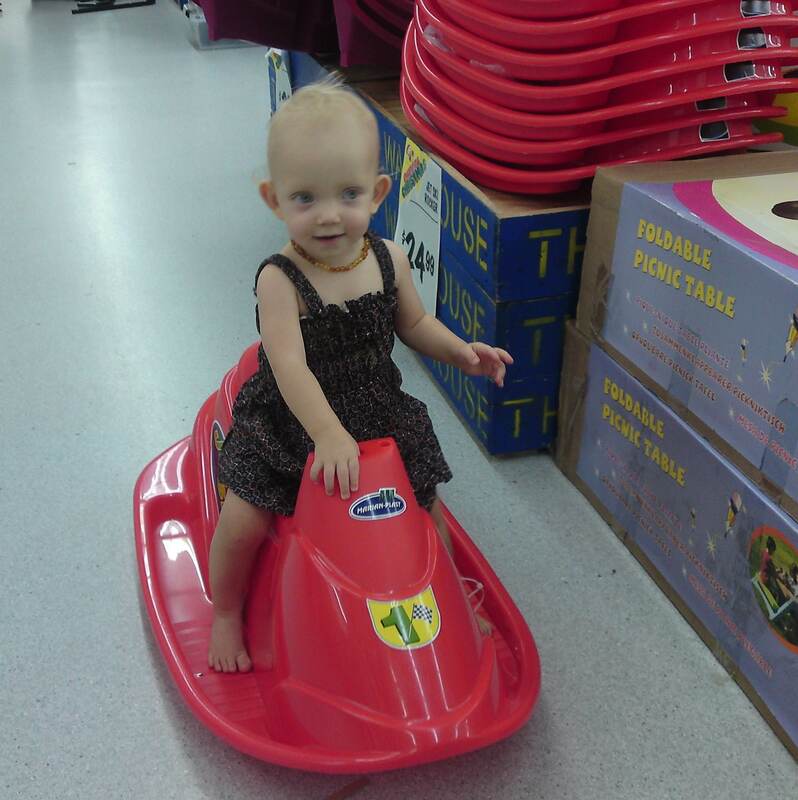 She pulled to stand at 9 months, started cruising at 10 months and walked at 14 months. While she achieved a number of milestones (just) within the “normal” timeframe, her physical weakness was obvious. She was wobblier than other kids, more prone to falling, had much less strength and endurance. Her gait was unusual, and for several years she would hold her hands up high for balance. Even now she doesn’t swing her hands in the natural “reciprocal arm swing” (hands opposite to the feet) way that comes to most children by the age of about two or earlier. 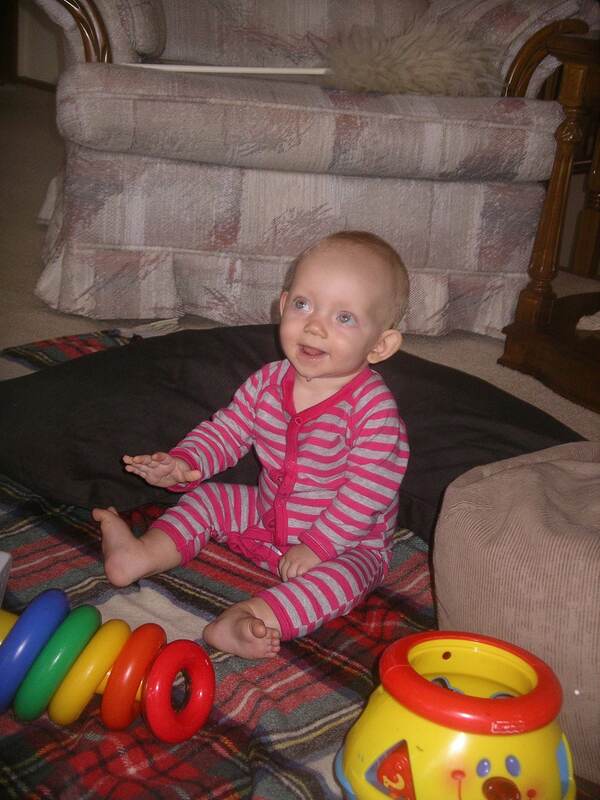 In regards to physiotherapy…we had a few “traditional” sessions from when she was about seven months old. These were helpful in terms of identifying her specific delays, addressing my concerns about her flat feet (since resolved) and her spinal curvature (xrays showed no spinal abnormalities, so we knew it was a core strength issue). She was officially diagnosed with low tone and hyperflexible joints, so we had a definitive explantion for her physical “weakness”. The public health system could only offer sessions sporadically, however. And we noticed the exercises they did with her were largely things we could do ourselves, with a little bit of research, and some dedicated effort. 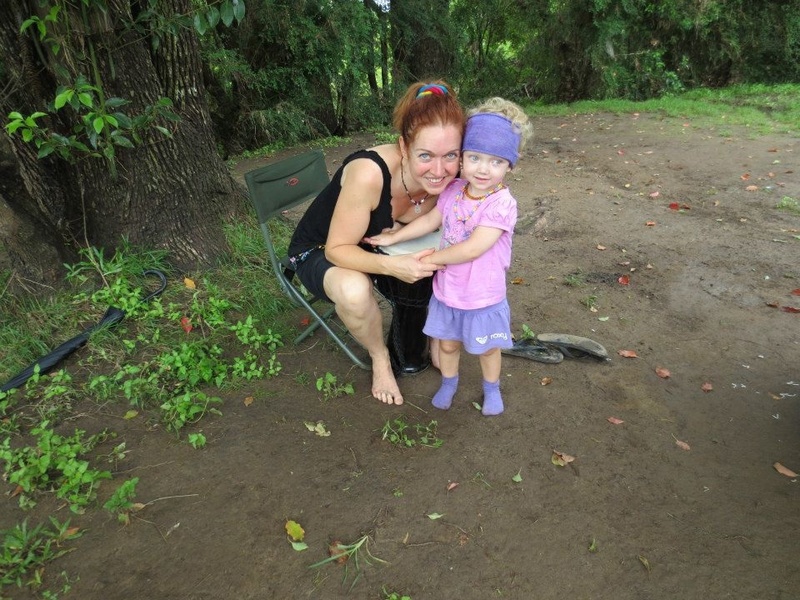 At that time, Sophie had 19 medical specialists and was attending physio, OT and speech. Our lives was consumed with doctors appointments, therapy, and driving to and from all of those appointments. I wanted her to have time to just enjoy the world. To be a kid, not a patient. So we decided to drop physiotherapy, and replace it with family activities that would help to develop her gross motor skills. We took her to Gymboree. We took her to playgrounds. All the time. We went camping. Often. 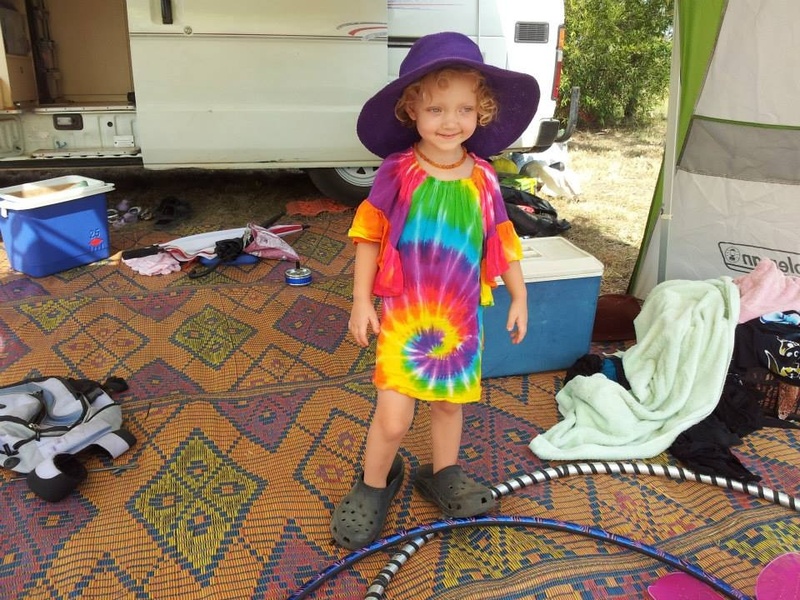 Camping was especially great for her once she started to be able to walk, as the different textures and gradients of the environment challenged her skills in balance and proprioception. Hills, grassy places, sandy spots, rocks, pebbles, tree roots and twigs. Puddles . 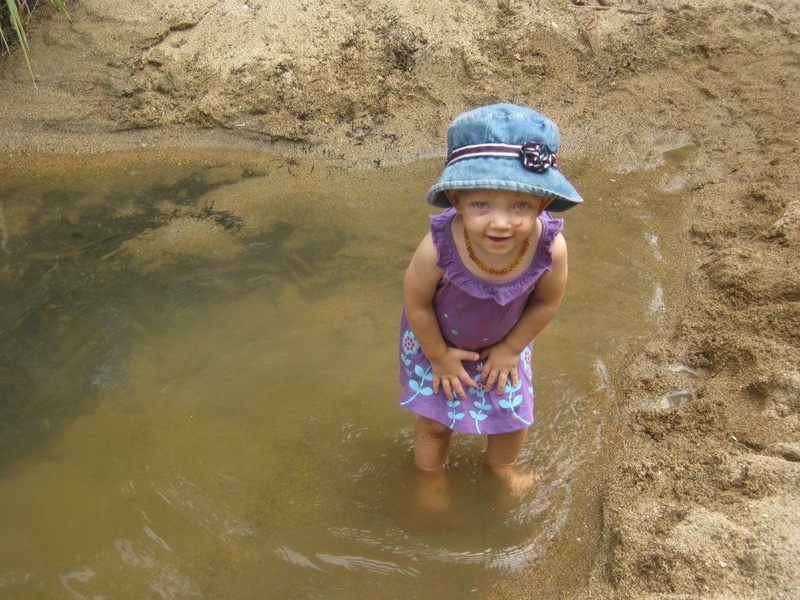 Creeks and water holes. 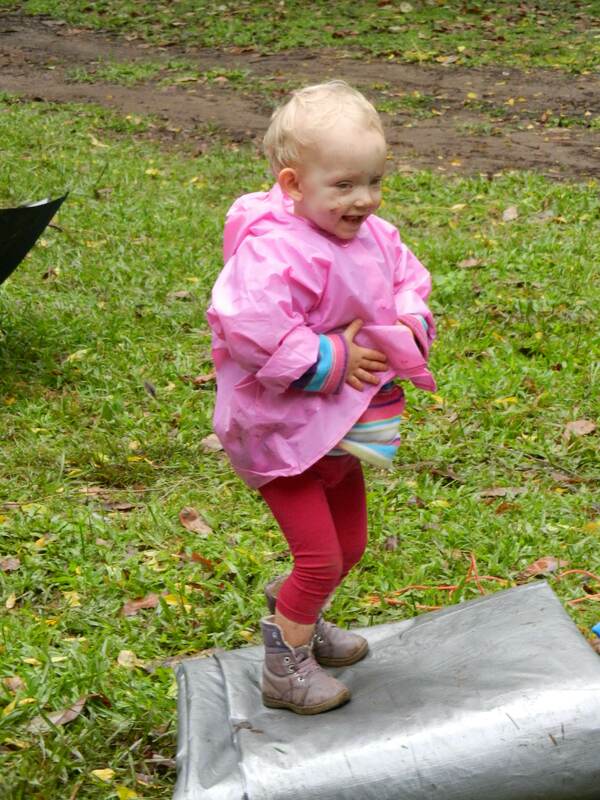 We noticed a definite “leap” in her physical abilities each and every time we took her camping. So we took her, even when packing the car seemed impossible. Even when the mere prospect of leaving the house filled me with dread. We had always loved camping, but the exhaustion of sleep deprivation certainly didn’t make it an appealing idea in the first couple of years. 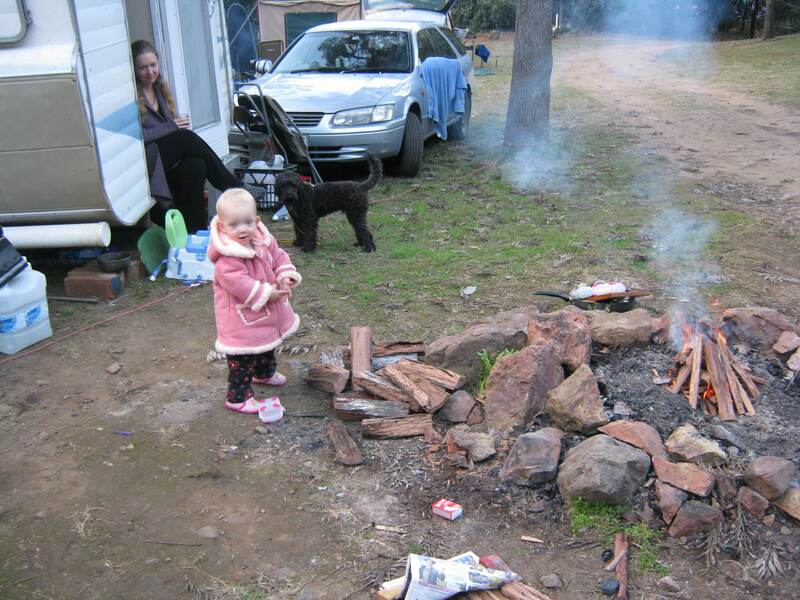 Luckily the rewards always outweighed the effort, and I have no doubt that all of Sophie’s camping experiences have not only improved her motor skills, but also helped her with her sensory issues and socialisation. Frank did a lot of work around proprioceptive awareness from when she was only a couple of months old, including rocking her from side to side, lifting her high into the air and and lowering her low to the ground, spinning her, rocking her. Frank carried her in a backpack before she could hold herself up, tucking her in tightly with towels. 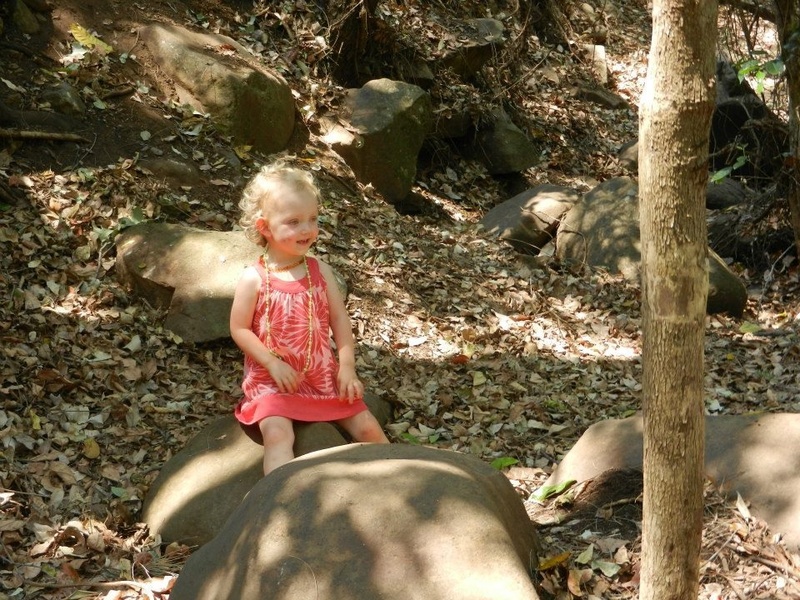 Once she was able to sit, we bought her a “bouncy tiger” and she sat on that for all meals, requiring her to continually shift balance and develop her core strength. Once she could stand with support we bought her a mini trampoline with a handle, and she was only allowed to watch TV if standing on the trampoline. Even before she could bounce, the gentle movement of the sprung base required her to continually readjust her balance. 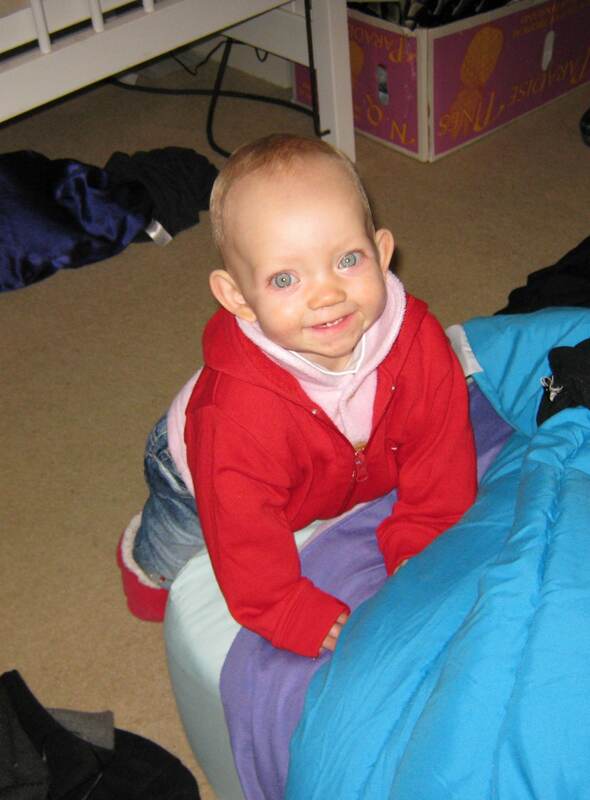 At two years of age Sophie, thanks to the financial support of my parents, we were able to start Sophie with an excellent private Occupational Therapist, Robyn Simms. Robyn worked (and continues to work) on fine motor skills and play skills with Sophie, but she also worked on her gross motor skills. Thanks to Robyn our repertoire of “tools” with which to help Sophie grew. We started to sit her on a Swiss ball, holding her by the hips, and moving the ball from side to side. As she grew in confidence, we would lie her on her tummy over the swiss ball, tipping it one way until her head nearly touched the floor, then pulling it back until her feet were nearly touching the floor. As her strength grew, we held her by the feet and put an object just out of reach, then rolled the ball forwards so she could reach out to grab the toy. When she was strong enough, we progressed on to holding her feet in the air while she supported herself on her arms, and moved forwards “wheelbarrow” style. We used a scooterboard to develop her core strength. We bought mini three wheel scooters of different heights, and without pedals, requiring her to develop the strength in her thighs and core in order to propel them forwards. 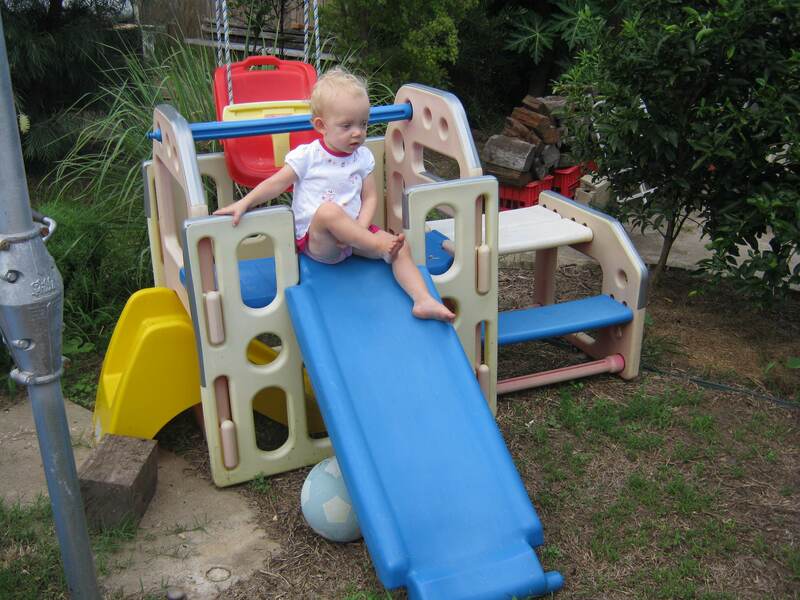 We bought three second hand slides of varying heights and angles, to help her with climbing and overcoming her fear of sliding. 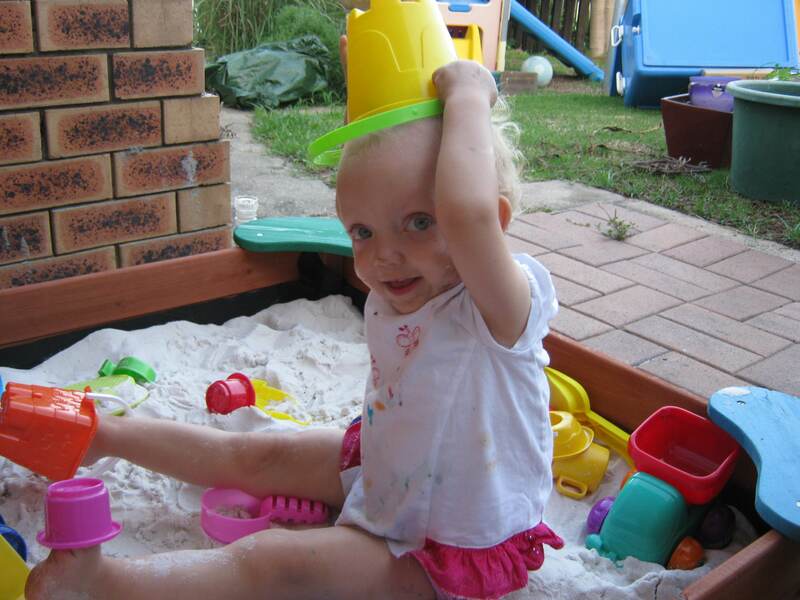 We installed a sandpit in the backyard, a swing, a climbing cubby and a rocking toy. I made sure that she carried anything she was strong enough to carry, to develop her overall strength. Sometimes she was reluctant and fearful to try new physical challenges. “All done now” was a phrase she used often. But despite her trepidation, she would always give it a go in the end. She showed so much courage and perseverance. Those are qualities I admire in her so much, and qualities that I’m sure will stand her In good stead throughout her life. At 33 months, she was finally able to jump with two feet, after working on this for more than a year with her occupational therapist. This is a skill that is usually achieved at about 18 months. What a day of joy and delight it was for us all! Developing her physical skills and confidence was (and continues to be) a team effort. My mother took Sophie to her occupational therapy sessions, which she videoed so we could watch. Sophie was staying with my parents for two days each week, and they diligently worked with her. We incorporated “physio exercises” into Sophie’s day, each and every day, but under the guise of “play”. 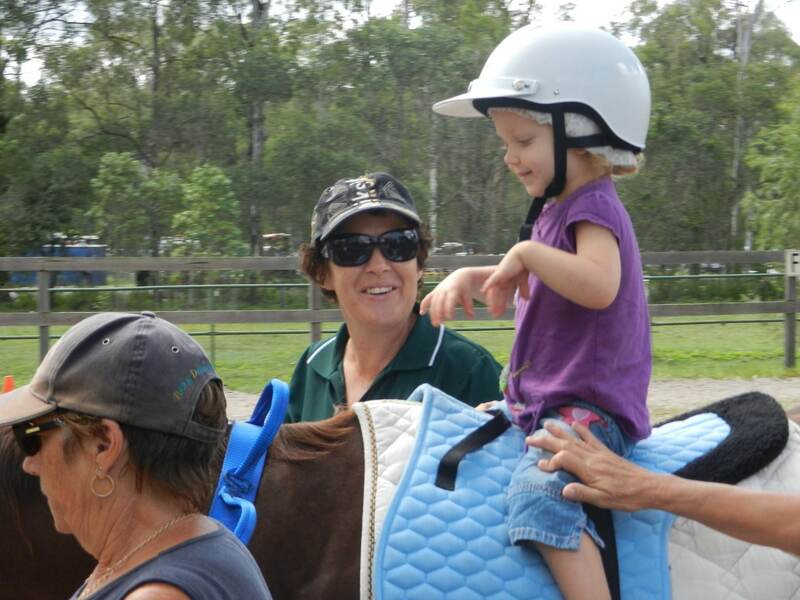 At the age of just three and a half she started horse riding with Riding for the Disabled…she was the youngest rider the centre had ever had. Thankfully the costs for this were low. 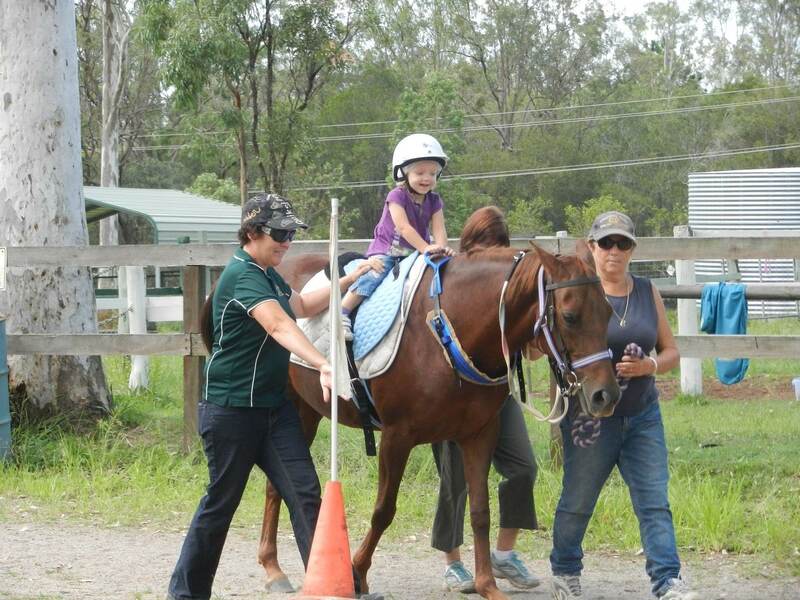 It equated to less than $20 per session due to the wonderful volunteers at Crowson Park RDA, who work for free, and the fact that her small respite allowance extended to covering the costs associated with caring for the horses etc.) Far cheaper than the $90+ per session that her other therapies cost. She screamed her way through the first few sessions, but thanks to the gentle care of the volunteers she soon lost her fear and began to thoroughly enjoy her sessions. Hippotherapy (horse riding therapy) has helped tremendously with her poor posture, curved back, low tone and sense of proprioception. It has also significantly increased her confidence and willingness to try new things. 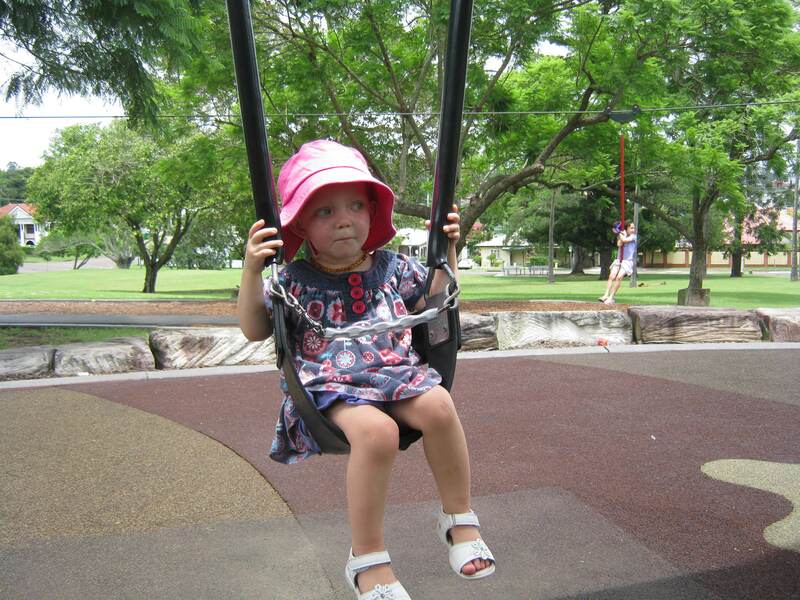 Now, at nearly five, Sophie is still more physically frail and clumsy than other kids her age. But she is accomplishing amazing things. She still requires supervision to walk up stairs…but she can do it…and recently started to do it with alternating feet! She has overcome her fear of “wobbly bridges” found in most playgrounds. 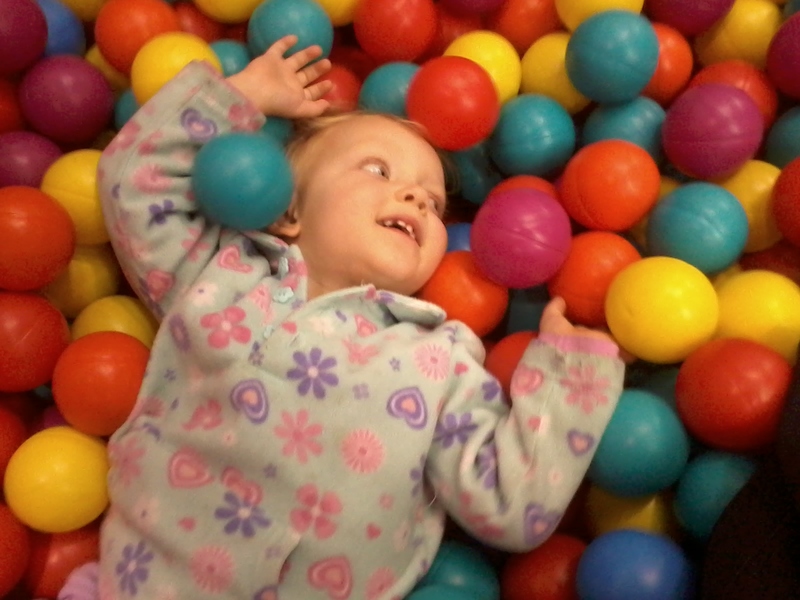 Recently she overcame her fear of jumping castles, and now delights in the joy of bouncing away. Her awareness of her body in space is becoming so much better. She can climb up ladders, and enjoys slippery slides. She loves using the rocking toys in playgrounds. She doesn’t scream in fear when other kids come near her on the playground equipment (kids can be rough, and when she was younger she was always getting pushed over and walked over..now she has the confidence to move out of the way, and even on occasion to push her way through to the front! ) And about four months ago she FINALLY started to bounce along and try a few “dance steps” when watching the interactive song and dance parts on playschool! 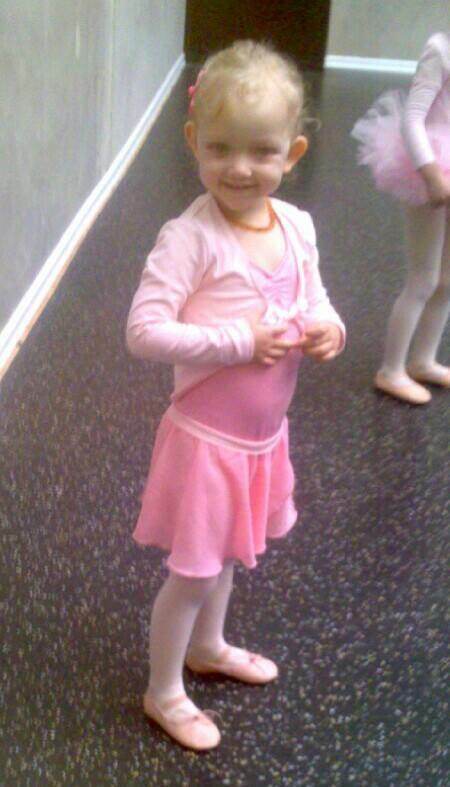 She has come so far that we have finally been able to enrol her in a ballet class. Something she has been asking to do for many months. Just six months ago she found it almost impossible to copy basic movements like a turn or a step to each side. A few weeks ago we proudly watched while she followed the teachers instructions through an entire thirty minute class. Perhaps not always in time, perhaps not quite as gracefully as the other kids. But she was delighted, and so were we. In terms of Sophie’s challenges, her gross motor development is currently the least of our concerns. That’s not to say she doesn’t have delays, and that continued intervention is not required. It’s just that in the grand scheme of things, we know she will be “okay” in this regard. She may not ever be the fastest swimmer, or the most graceful dancer, but she has great mobility…good enough that it no longer interferes with her capacity to join in on the playground. She can enjoy the delights of trampolines, and slippery slides, climbing, and playing “can’t catch me”. And really, that’s what matters. Her gross motor skills may become a higher priority again in the future. At the very least, I’m guessing there will be a conversation or two as she gets older, and begins to notice that she is not as physically adept as the other kids. 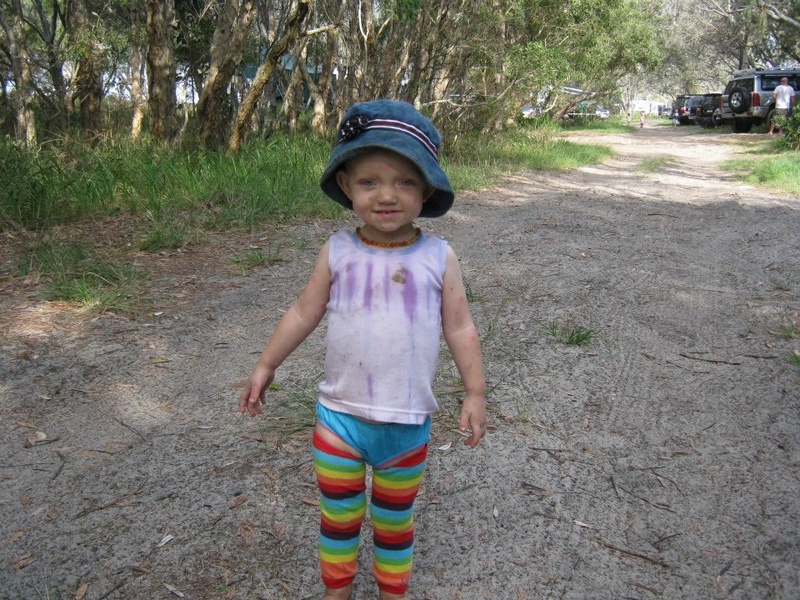 And children with Kabuki syndrome are prone to developing terrible joint problems, particularly with their knees and hips, often requiring surgery. But that may or may not be in store for Sophie, and there is no point worrying about it right now. 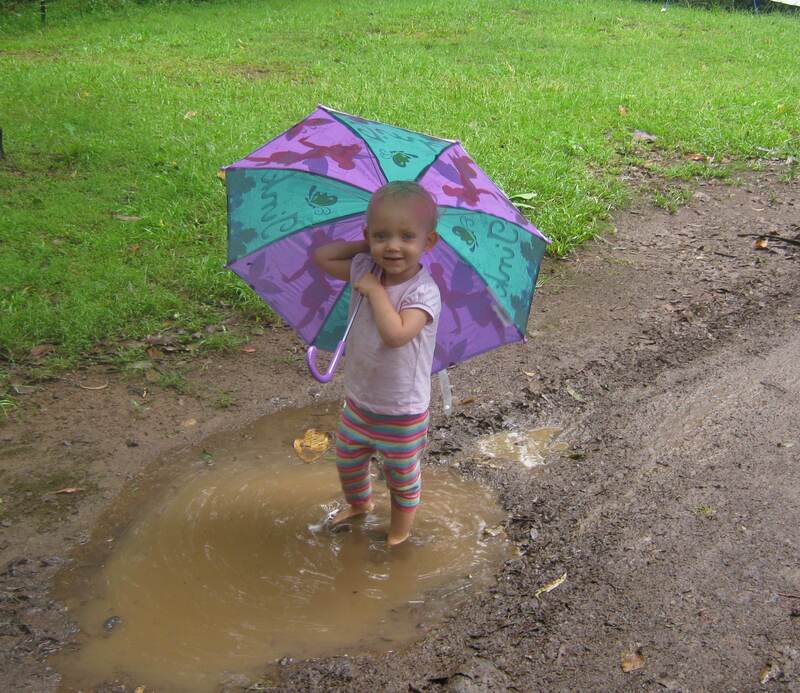 In the big picture, her gross motor development is an area that we have allowed ourselves to relax about. Sure, we need to give her extra input, she needs more practice to master physical skills, we can’t totally “take our eye off the ball”. But we are blessed that she is as physically able as she is. And we no longer expend so much energy on this area of her development. We have been incredibly lucky in this regard, as many children with Kabuki Syndrome take much longer to get where Sophie is. Many don’t walk until three, four, five or older. Some require orthotics or other physical aids such as walkers. Some are in wheelchairs. We are tremendously grateful that Sophie has had fewer struggles with her gross motor development than many of her Kabuki peers. And knowing how lucky we have been makes us all the more excited and delighted when we see other “Kabuki Kids” start to sit, crawl, walk, dance and play. Overall, while some areas of her motor development are still significantly delayed compared to “neurotypical” kids, she is doing fabulously. She may be clumsier than the other kids. But now when she falls, rather than tears or hysteria, she just laughs and gets straight back up again. A wonderful lesson for me to take on board…when you fall..laugh and get back up…keep trying, and never give up! Thank you baby girl for teaching me…I hope I will take your lessons on board sooner rather than later.